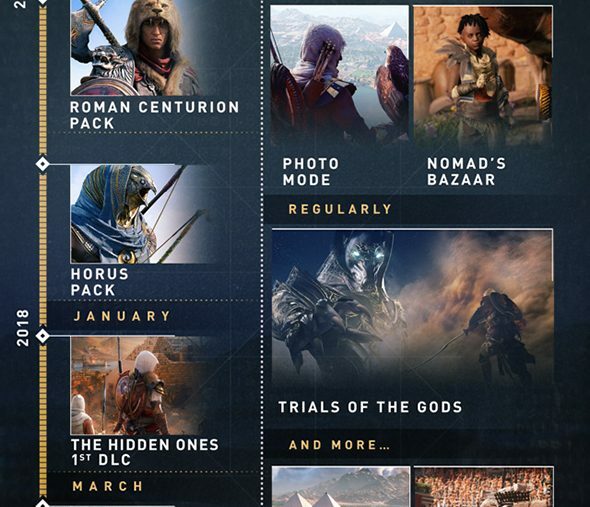 Update, January 16 2018: Ubisoft have detailed the rollout for Assassin’s Creed Origins DLC over the next few months, including a date for the free Discovery Tour mode. If you’ve got all you can out of the historical Egyptian murder in Assassin’s Creed Origins, Ubisoft have some welcome news: the DLC will be out soon, as will the free, combat-less Discovery Tour mode. We spoke with Egyptologist about the possibilities of discovering history in Assassin’s Creed Origins. The releases kick off with The Hidden Ones on January 23, which is the first major piece of the game’s season pass. This follows the growth of the Brotherhood four years after the events of the main game, increasing the level cap to 45 and giving you access to new weapons including Legendaries, new mounts, and a new outfit. 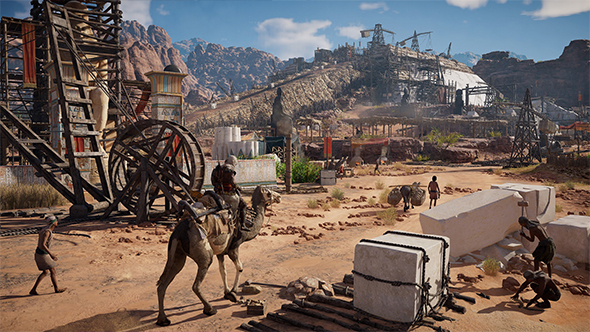 The Discovery Tour mode will allow you to explore the world without combat to see the game’s depiction of Egyptian history and daily life starting February 20. You will also have the option to follow guided tours curated by historians. If you’re purely interested in digital Egypt rather than Assassin’s Creed, you’ll be able to get this mode as a standalone purchase. Finally, the second DLC, The Curse of the Pharaohs, releases on March 6. Similar to the other new content, this expansion adds new outfits, gear, and weapons, and bumps the level cap again to 55. This one features a “completely new storyline” set in Thebes, centered around Egyptian mythology, bringing you face-to-face with mythical beasts and long-dead pharaohs. If you need more Assassin’s Creed Origins in your life, the season pass is available for $39.99 / £34.99 / €39.99. But remember:chocobos are free. Original story, October 10 2017:After a two-year break, Ubisoft’s historical murder franchise is returning with Assassin’s Creed Origins on October 27. Today, Ubisoft have detailed all the additional content coming to the game post-release, including both paid story content included with the season pass and free updates offering a variety of new challenges. The most eye-catching of the free content is called the Trials of the Gods, where a glitch in the Matrix – sorry, the Animus – has you doing battle against massive Egyptian deities during special timed events. This will be available starting 15 days from the game’s launch. On the initial release date, however, you can enjoy the daily challenges of the Nomad’s Bizarre as well as a Photo Mode, both of which will be come as a free update on launch day. In early 2018, you’ll also be able to fight in the Gladiator Arena in a horde mode. (Yes, no euphemisms, they’re just calling it horde mode.) The fascinating history-themed Discovery Tour will also be available in early 2018. Paid content will include a pair of story expansions. The first pack, the Hidden Ones, will be available in January 2018 and focuses on the Brotherhood clashing with Roman forces three years after the main story’s conclusion. It’ll feature a new region and an extended level cap. The second pack is called Curse of the Pharaohs, and will have you doing battle against undead rulers, Anubis warriors, and giant scorpions in a new mystical world. This pack releases March 2018 and will also include both a further extended level cap and new abilities. The season pass will also include a pair of new equipment packs to release in November, a bonus of 500 in-game Helix Credits, and the exclusive Calamity Blade weapon. The price of the season pass hasn’t been officially announced, but I imagine the cost of the Gold Edition ($99.99 / £74.99 / €89.99) which includes the pass would give you a pretty solid clue.